If you have already wandered through Paris, some of these recommendations may be known to you. If you’d like to skip the breakdown and scroll to the bottom there is a link to a map I’ve created with more researched places to explore. Musee d’Orsay - This beautiful museum, previously Gare d'Orsay a Beaux-Arts railway station built between 1898 and 1900, now houses a staggering collection of Impressionist art, as well as other items created between 1848 and 1914. Passages (Des Panoramas, du Grand Cerf, etc). These gorgeous, covered passageways are tucked away in many parts of the city. If you see one, duck inside! Some of these shops have been there for hundreds of years, and there’s cute wine bars and trinket stores to peruse - perfect reprieves during drizzles or gusty winds. Catacombs - TOTALLY WORTH SEEING. But fair warning: The lines are long and the weather is not always favorable as you wait outside. Make sure you use the restroom ahead of time, because once you pay at the top of the stairs, there’s nowhere to go until you’ve popped back above ground a few streets from where you started, at least 45 minutes after your descent. And there’s no bathroom in the gift shop. Notre Dame - Again, probably pretty obvious, but I have a little tip for you: The back of the Cathedral has a lovely garden and forum of trees with benches. Bring a box of macarons or eclairs with you and enjoy the calmer, quieter side of Notre Dame. Versailles - you probably know of it already, and it’s def worth the trip. Before you go, learn to appreciate the Gardens at Versaille and the history of French Garden Design even more by watching Monty Don’s French Garden episode on youtube, or his entire garden series on Netflix. It’s extremely soothing and inspiring. Akin to the feeling of watching Bob Ross paint ‘happy trees.’ If you don’t want to pay for the audio tour, simply read up about Versailles’ history on wikipedia on your way there, it’s roughly 45 minutes on the Metro. Cluny - a mideival art museum and rare example of 15th-century secular Gothic architecture, also has the best/oldest examples of Roman ruins in the entire city. Invader - What’s invader? It’s the pseudonym of a French urban artist, whose work is modeled on retro 8-bit video games… and they’re EVERYWHERE in Paris. Invader works incognito, often masked and largely at night. Using the "FlashInvaders" app, players can hunt globally for installed pieces. Whether you utilize the app or not, finding these invaders is not a difficult task, and you’ll never see the same piece twice. Sacré Cœur Basilica - (Sacred Heart) The iconic basilica at the top of the hill can be seen from many vantage points in Paris, and is a fantastic spot to gaze over the city. I love it at night, when it’s a little less busy with tourists, and all the lights of Paris are twinkling below you. Le Palais Royale - lovely gardens across from the Louvre, great for a picnic. There are some really neat shops & places to eat tucked in the street surrounding the palace. Views from Ponte Neuf - is the oldest standing bridge across the river Seine. It stands by the western (downstream) point of the Île de la Cité, the island in the middle of the river that was, between 250 and 225 BC, the birthplace of Paris, then known as Lutetia, and during the medieval period, the heart of the city. Fantastic views from this bridge at night. Walk thru a cemetery - Père-Lachaise is the celebrity cemetery. From Balzac to Chopin to Oscar Wilde (the tomb worn away by the kisses of visiting admirers), the talent-spotting is endless. 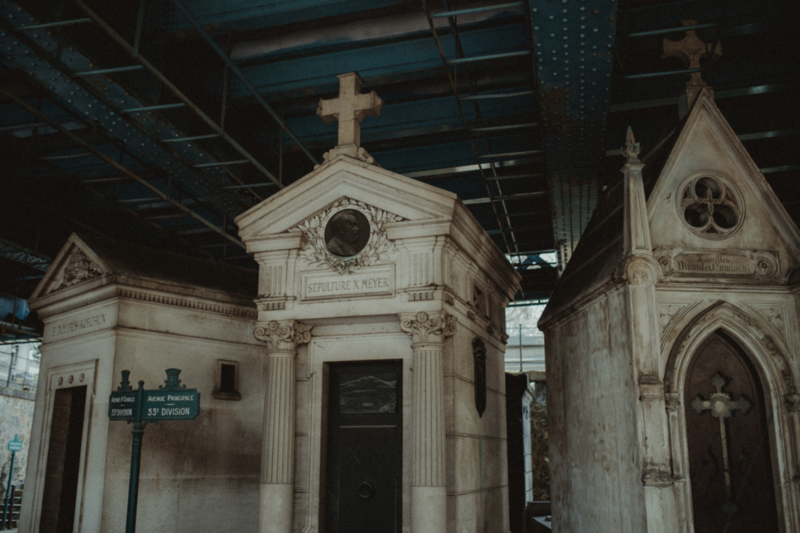 My favorite is Montmartre Cemetery (French: Cimetière de Montmartre) is a cemetery that dates to the early 19th century. It is the third largest necropolis in Paris, after the Père Lachaise cemetery and the Montparnasse cemetery. Les Puces de Saint-Ouen / The Marche - The Marché is generally viewed as the biggest flea market on the planet – with 3,000 traders and nearly 180,000 visitors each weekend. It started life as a humble rag-and-bone setup outside the city’s edges – but has, perhaps inevitably, turned into a more upscale affair, with lots of boutiques and antique stalls. It feels just as much a museum as a market. There’s plenty of drawings, prints & paintings for sale at only 10 euro a piece, and tons of old brick-a-brack to rummage through. Officine Universelle Buly 1803 - Perfumes made a' l'acienne - the same way for 200 years! The closest it gets to traveling back to the era of belle epoque. All perfumes are alcohol & Glycerine free in glass bottles with watercolored labels. A splurge-worthy piece of history. We bought the hand creme and it’s the most moisturizing, subtle-scented lotion I’ve ever used. Deyrolle - Est 1831. A menagerie of curiosity! Exotic creatures, taxidermy big and small. A self-described “Parisian cabinet of curiosity,” Deyrolle was founded by passionate entomologist Jean-Baptiste Deyrolle, but insects are not the only creatures to be found inside this temple of taxidermy, where lions and tigers and bears (and zebras and emus and antelopes) greet you at every turn. For something a little easier than an elk to take home on the plane, the vintage natural history posters – reliably detailing everything from shells to snakes to sugar production – make excellent souvenirs. OFR Bookshop - multilingual bookstore with printed maps, notebooks and magazines. Great way to practice your French at home with a book of French poetry or a Parisian Artists’ biography. G.Detou - a play-on-words, meaning “I have everything.” Here’s a great write-up about the anything-baking-related shop where you can get specialty foods, including chocolate, mustard, honey, and olive oils.… and most uniquely: Crystalized/Candid Violet Flowers, my sister-in-law’s favorite! E.Dehillerin - Two stories of cramped aisles packed with cookware and specialty gear. Famous for their gorgeous copper, in the basement. The plastic pastry scrapers with their logo on them make inexpensive, and excellent, gifts for baker and cooks back home. Anthony Bourdain once bought a Duck Press here during one if his travel show trips to Paris, which is how we first found out about it. L’Habilleur - If fashion is your passion, this designer discount shop specializes in indie brands ranging from Roberto Collina to Henrik Vibskov might be for you. If you're lucky, and if you spend enough time looking through the racks, you might just find a rare Issey Miyake blouse, or an amazing archival Jean Paul Gaultier dress at up to 60 percent off its original price. It's also located in the Marais, which means there are plenty of places to walk around and explore whilst shopping! Kiliwatch - The trailblazer of the rue Etienne-Marcel revival is filled with hoodies, casual shirts and washed-out jeans. Brands such as Gas, Edwin and Pepe Jeans accompany pricey, good-condition vintage garb. Kiliwatch is also a prime spot for designer sunglasses and even watches. In short you can get your entire look under this one (and rather hip) roof - And there are literal piles of vintage silk scarves here for 10-15 Euros a piece, which make perfect souvenirs. 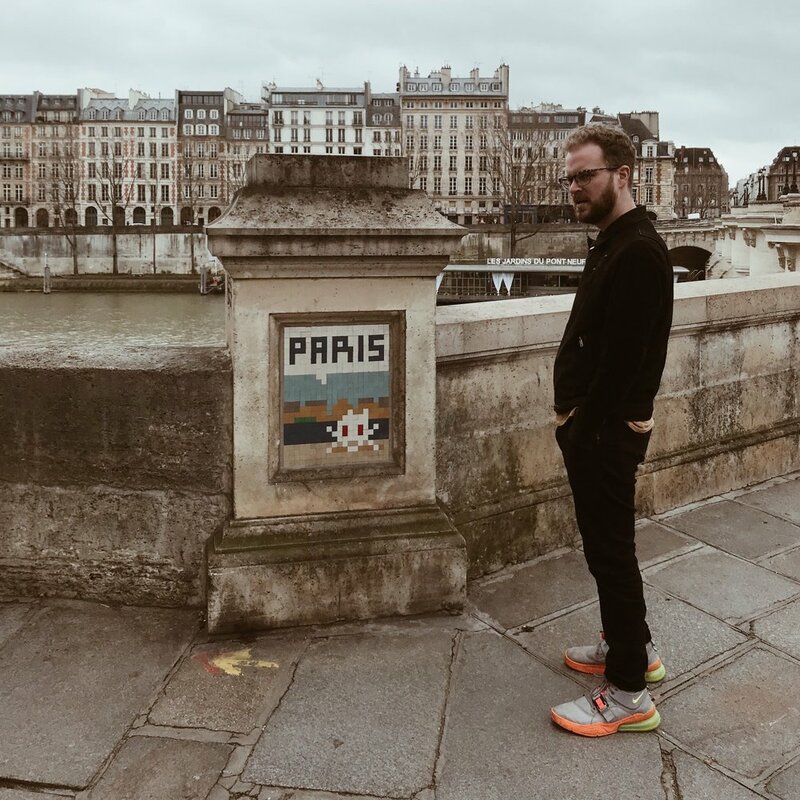 Merci - Stepping into Merci in Paris is quite the experience. With racks of clothing, home goods, specialty paper, handbags and more scattered throughout the shop in unconventional places, it's hard not to get lost just browsing the boutique for hours. Merci is an unexpected pick for shopping because its sheer size makes it feel similar to a small department store, but you're more than likely to walk away with a quirky find (whether it be a notebook or a blouse) from one of the shop's indie labels you've probably never heard of before. Episode - A local vintage shop chain with stacks of berets, gloves and other easily-packable accessories with affordable prices. Lockwood - An American-sized helping of Avocado toast will keep you going well into the afternoon. They have decent Coffee, too! Very cool basement bar opens in the evenings. Clause - a few locations in Paris, great breakfast & takeaway treats. Wild & the Moon - Local to-go chain with organic, vegan and gluten free options. They don’t use plastics in any of their products. Croissant - You can get ‘em just about anywhere and it’s a great way to start your day. I prefer the pain au chocolat, which is a chocolate-filled flaky croissant. LouLou - After walking the Gardens near the Louvre (Jarden du Tuilleries) stop at the oh-so-chic LouLou for lunch. It’s swanky, but mostly affordable. Wonderful views of the Louvre & hearty pasta dishes. La Recyclerie - Cafe, Restauraunt, Bicycle repair Shop and all around cool Kids’ Hangout in Montmartre. If you go, don’t be shy; walk all the way down to the train tracks out back. Lots of seating and whimsy. Markets + Bench - No, it’s not actually a restaurant, but a recommendation: Instead of sitting down to eat, find the nearest Market/Marche and get a fresh baguette from the Boulengerie, Cheese from the monger, meats from the butcher, jams and sweets from the Pattisserie and have a picnic! You can even enjoy some wine as long as you’re discrete on the street. Beef Club - if you’re carnivorous, you’re gonna love this place. My husband had the “best hangar steak of his life” this last trip, and they know so much about where their meats come from, they probably knew the beasts’ middle names. Once you’re good and full, enjoy a night cap underneath the restaurant in an old cabaret lounge lit only by candlelight. It’s groovy and romantic. And the cocktails are delicious, too! Frenchie Wine Bar - First off, Frenchie is located on one of my favorite streets in Paris, next to one of my favorite areas/markets. Rue Du Nil is scenic and inviting. Frenchie has their name on a few things here: Frenchie To Go (Take away and breakfast goodies) Frenchie Wine Shop (Buy a bottle to go from their curated selection), Frenchie (a Michelin starred, nearly impossible to get into restaurant with amazing reviews) and… Frenchie Wine Bar. A petit Brasserie with cozy walls, shared tables and a small seasonal menu that’s always changing. Get there when they open for dinner to ensure you don’t wait an hour or more, it’s definitely worth it. Abattoir Végétal - located in a former butcher shop, the Vegetarian/Vegan restaurant’s name means “Vegetable Slaughter,” and is a fun and playful place to fill your face. Also great for Breakfast & Lunch! SuperNature - wonderful plant-based cuisine, wines & friendly Staff. Vegan options available - and I highly recommend trying the avocado-based ganache pudding for dessert. You’d never guess it was made with avocados! Maison Plisson - My favorite place to pick up seasonal food from local french purveyors and farmers. Amazing take away selection and great, helpful, knowledgeable service. You can also eat at the restaurant. There are two locations in Paris, both equally great. We stocked up on organic snacks and fresh juices for our bnbs here. Frenchie Wine / Frenchie To Go - I already touched on these before, but wine for winding down at night and breakfast and lunch options available on the cutest little street. Burgers Le Ruisseau - I know, who goes to Paris and then eats burgers? Well, about a week in, we were craving them. And these were the best! Vegan options available and a take away counter if they are busy. Also great late-night. Rue Montorgueil Market Street - Impressive selection of butchers, florists, produce & cheese stands. As well as home to one of the most historied Patisseries in the city, Stroher (see more below). Also a great street to sit down outside with a glass of wine and people watch. O’Chateau - award-winning wine bar with over 40 wines by the glass and hundreds by the bottle. I recommend settling into one of their well-curated wine flights and ordering a plate of cheese or charcuterie. The staff is extremely kind and knowledgeable, and the atmosphere is cozy. Harry’s NY Bar - This is the birthplace of many popular cocktail classics such as the Bloody Mary (1921), Side Car (1931) and the French 75 (1925) or in French a ‘Soixante Quinze’. The drink dates to World War I, and an early form was created in 1915 at the New York Bar in Paris—later Harry's New York Bar—by barman Harry MacElhone. The combination was said to have such a kick that it felt like being shelled with the powerful French 75mm field gun. It’s made with gin, lemon juice, sugar, champagne & a drop of absinthe. Not much has changed at Harry’s, there’s a lot of old school charm. Any place that looks like this - a street-side cafe with a cheap glass of wine and people watching from a small, occasionally cramped table is worth so much more than the 4 Euro it will cost you (Example: B&W photo of Le Compas). There’s plenty of notable Boulengeries (Bakeries) and Patisseries (Pastry shops) on the map below, but here’s a few I can surely vouch for. Also, it’s hard to have a bad experience at any bakery in the city -the French take their bread VERY seriously. Stroher - Est 1730. When Louis XV married Polish princess Marie Leszczynska, her personal pastry chef Nicolas Stohrer accompanied her to Paris and opened a shop on Rue Montorgueil, providing pastries to the French court and the public alike. Almost 300 years later the patisserie is still there, now the oldest in Paris, producing babas au rhum, salted caramel éclairs and pains au chocolat fit for a princess. Frannie’s Bakery - This place doesn’t seem to have a name, unless it’s actually just “Boulangerie - Patisserie.” Our dear friend Frances did a semester in Paris and swears this is the best bakery in the whole city. She recommends the Ham & Cheese Croissants, but get there early, they were sold out the afternoon we went. We settled for a ham & cheese baguette instead. It was delicious. Le croissant au jambon et fromage can be found at: 81 Rue de Rennes in the 6th. Le Meurice Cedric Grolet at 6 rue De Castiglione - Trying to describe what this World-Renown Pastry Chef does is even harder than trying to remember the name of the place. Peep the Instagram. Then get in line 45 minutes before they open for a swift entry. They’re only open for 4 hours a day, on select days, and often sell out. You will spend $17 on a pastry that looks like an apple, but it’s not an apple. And upon eating it you will wish you bought a whole bushel. Chains like Le Pain Quotedien. They’re everywhere, even the states - it’s basically the French Starbucks. And there’s always a local bakery on the same block. Only go if you’re looking for a public restroom. Same with MonoPrix - A supermarket / supermarché chain. If you need something in a pinch they’re everywhere which is great, otherwise get your meats and cheeses from the open markets and local establishments, it’s fresher and a more intimate experience. Stopping in the middle of the sidewalk - Just a huge pet peeve. Always step to the side when you need to stop to take photos, check your map, wait for a friend, etc. And look both ways before exiting a store or shop, many of the sidewalks are very narrow and often others are not paying attention. Speaking loudly in public places - The French speak softly in restaurants and bars. Make sure you’re not the loud American in the corner complaining about the bathrooms or service. Deep Tissue Massages - especially if you plan on doing a lot of walking. You’ll be sore for days. I’m telling you this from experience. Get the massage when you get home, otherwise walking to the top of Sacre Couer will be ten times more arduous. Choosing a place to eat without checking if they are open - Many French restaurants close for a few hours between their lunch and dinner service. You don’t want to find yourself hangry and having to wait 2 hours before you can try a place, so always check kitchen hours on their website. Sometime Google gets it right, but not always. Sometimes you can still get drinks, but not food. When in doubt, just call and ask if their kitchen is open. while always knowing what’s around the corner.